and “behaviour” is defined by actions which can be seen by an observer watching the animals. 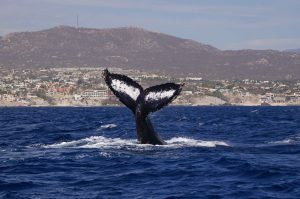 Cabo Trek is one of the few companies in Cabo San Lucas, which provides onboard of its whale watching trips a marine biologist researcher and guide who is going to explain everything about the cetaceans for you. Humpback whales are one of the best known and easily recognizable of the large whales: known for its frequent acrobatic behaviour and the tendency to occasional approach the vessels. Head slap – it occurs when a whale lunges or leaps its head out of the water, striking the underside of the chin on the surface of the water. This is a behaviour often observed after a breaching sequence. 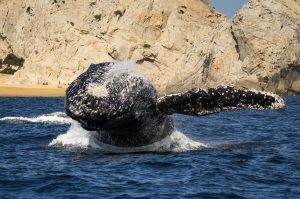 It may be used to communicate, to loosen parasites that may have attached themselves to their skin, or as an aggressive behaviour if it’s towards others whales. 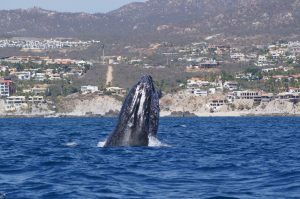 Peduncle throw – it’s observed when the whale throws the lower portion of its body, including its flukes sideways across the surface of the water. It’s a very energetic and aggressive display and it usually take place as part of the mating activities as a warning signal to others or bash other whales during competition. Tail slap – usually in the vertical position, whales raise their tail out of the water and slapping them forcefully against the surface. This is a behaviour repeat over and over and may be used to communicate or a warning to others in the vicinity. Breach – breaching is defined when the whale takes more than 40% of the body out of the water. The purpose of this behaviour is still unknown. It may be to communicate with other whales nearby, dislodge parasites from their skin, stun prey, stretching or simply for fun. Spyhop – it is described when the whale stands vertically and raises its head clear of the water. They may then slowly turn to look around, then drop back down in the water. Pec slap – during the pec slap, a whale will lie on their side or back, rise one or both pectoral fins clear of the water and slap them on the water surface. This is another behaviour that can be displayed repetitively. Fluke – the tail of the whale appears out of the water in an upward arch and slowly rolls underwater. 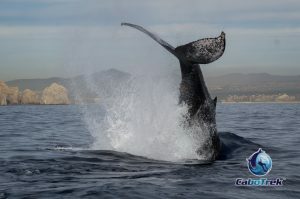 The entire ventral surface is seen and is often the best way to identify a humpback whale. 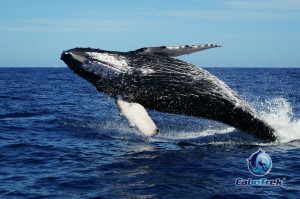 Humpback whales are wild animals and we respect their freedom. They are already in Cabo. 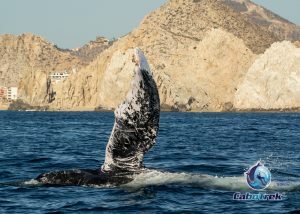 Be a Cabo Trek guest and learn more on our educational whale watching tour while observing these gentle animals in their environment.